Paul Jutte trained in Nijmegen and Amsterdam for general medicine. 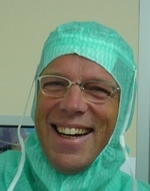 He did his orthopedic training in Groningen (1997- 2003) and a fellowship in orthopedic oncology in Bologna (Italy) (2003) and Los Angeles (US) (2005). He did a PhD on spinal tuberculosis (2000-2006). He is associate professor in orthopedic surgery. His main interest is in treatment of bone tumors and infections; since 2002 his position is at the University Medical Center Groningen, one of the four centers for orthopedic oncology in the Netherlands. His current research is aimed minimizing tissue damage, improving safety and efficacy of surgical treatment of tumor and infection. He works on local tumor ablation using minimal invasive image guided strategies and intraoperative image guidance with computer assisted surgery and patient specific 3D instruments and implants. He studies diagnosis and treatment of complex infections of biomaterials and bone. He set up a regional network for orthopedic infections in the North-Eastern Netherlands (NINJA). He is head of the division of orthopedic oncology, chairman of the UMCG soft tissue and bone tumor working group and member of the national bone tumor committee. Dr Jutte is principal investigator at RUG and wrote more than 50 peer reviewed papers, he is co-program leader of BIOBI (research program on biomaterials and infections Kolff institute). He is head and principle investigator of the LEAK study, a nationwide study with > 30 hospitals participating to find the best way to treat wound leakage after primary hip or knee prosthesis (ZonMW financed). He is visiting professor since 2015 at the Jiaotong University Medical Research Center at Xi’an, China. He has done many lectures and workshops at conferences and universities worldwide.